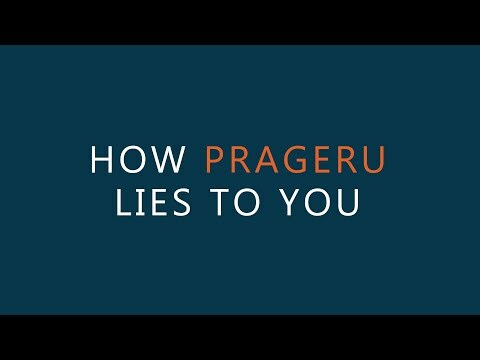 this is the first time i hear of Prager U but it seems they make among the most easily rebutted right wing arguments on the internet – after youtube comments. not sure if they are a menace for giving the right wing something to link, or a blessing for giving too many people the worst argumentative tools. every video in this channel is bonkers. i’m signing up on patreon for this guy. this is the first time i use patreon. -LA: Tuesday but seems it could be any time between 4pm and 7pm? Someone saying they never saw or expected the email from me on Wednesday (I usually have been sending it over KakaoTalk, but felt that this time it didn’t merit the level of “urgency” in an instant message), gave me a glimpse of what is going on with all these people communicating over Instagram or Facebook messages. The email economy has collapsed for a sector of the population. There is the failure of most email systems (hopefully excluding gmail) to control spam, that was the first wave of push away from email. Then, there was the gradual takeover of legal, semi-legal and even opt-in email communications overriding legitimate person-to-person emails. Instead of clearing up the mess (which is a lot of work and used to be highly technical in the early days), people simply moved to another platform that was newer, and therefore had fewer irrelevant messages. No business sends promotional content over Instagram or Facebook messaging.. yet. They already have their own venue – timeline posts, in which they are focusing all their attention. Which explains why get out the vote text message communications is so effective. It may also explain why instead of revamping the gmail interface, Inbox was created in a way to allows you to only focus your attention to emails that matter, where there’s the “personal stream” akin to social media messaging, and “email stream” which is the classic email. In a sense, Inbox made email too social media-like, which would have turned off traditional email users. That means, that just like how people moved away from email, as social media advertising becomes increasingly crowded, businesses will eye non-timeline advertising. “Can we put an ad on the side of where users look at their individual messages?” “How about an ad in between individual messages?” Social media platforms probably know that that would be the beginning of the end of their relevancy as a platform, and try to keep the businesses busy with timeline advertising. How long will that last.. I was looking at numbers for #CA39 in the Orange County Registrar, assuming that it would have the quickest turnaround. Then I found a Twitter account that was showing numbers consistently lower than the OC Registrar, and it hit me: each county registrar reports only on their own county’s results. So CA39 shows up in three county’s reports separately. I see the Korean Press was only looking at OC numbers as well, as they reported the difference as 55% vs 45% (even at the time of the reporting last night, the district-wide difference was actually 53/47). 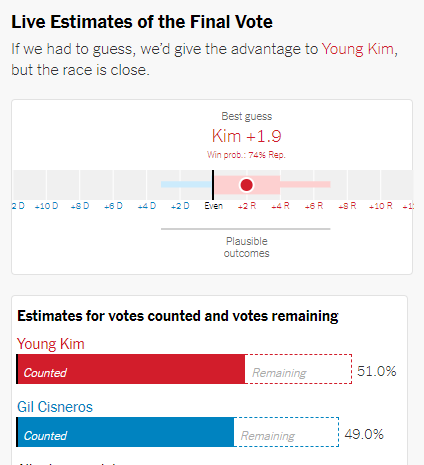 Still, Republican candidate Young Kim holds a lead over Gil Cisneros, at 51.3 vs 48.7% (4,000 votes difference) without including the late ballots. It’s not impossible, but it will be pretty tough to reverse the trend in late ballots. I think Trump said “if Dems win the house, there will be a wave of crimes, alien invasions, and violence.. lots of violence. And it’s gonna be your fault, not mine.”.